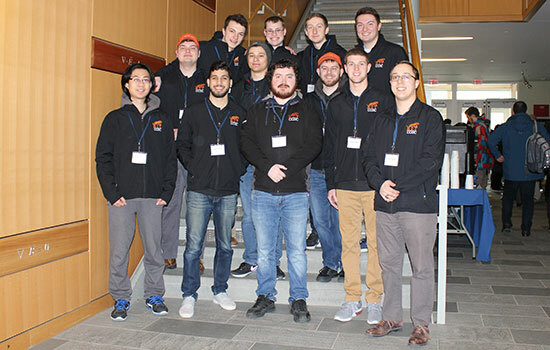 A team of RIT cybersecurity students took second place in the 2018 Northeast Collegiate Cyber Defense Competition (NECCDC) held March 16-18 at University of New Hampshire. A team of Rochester Institute of Technology students took second place at the annual Northeast Collegiate Cyber Defense Competition held March 16–18 in New Hampshire. RIT’s cyber defense team is a perennial contender at the regional and national competitions. The Tigers won regionals and attended the national competition last year. RIT also placed third at the national competition in 2015, second in 2014 and took first place in 2013. In this year’s scenario, teams were brought into a fictitious security company called “Wild Eagle” and were expected to secure the network after members of their previous team left the company. Students had the opportunity to test their skills securing and defending widely deployed technologies, including Windows and Linux servers and workstations, next-generation firewalls, and cloud services. Anthony Critelli, coach of the RIT team, said that the team did an excellent job of shutting down the red team’s access at the beginning of the competition. Other participants in the regional competition included University at Albany, University at Buffalo, Champlain College, University of Maine, University of New Hampshire, Northeastern University, Stevens Institute of Technology, United States Military Academy West Point and Westchester Community College. At the event, students had the opportunity to network with sponsors from Raytheon, Amazon Web Services and other companies. The RIT student team is made up of team captain Kyle Carretto, a fourth-year computing security student from Corfu, N.Y.; co-captain Brandon Adler, a fourth-year computing security student from Pittsford, N.Y.; Brandon Dossantos, a third-year computing security student from Westwood, N.J.; Russell Babarsky, a third-year computing security student from Fairview, Pa.; Rayne Cafaro, a third-year computing security student from Denville, N.J.; Joe Graham, a fourth-year computing security student from New Hampton, N.Y.; Jack McKenna, a first-year computing security student from Saint Paul, Minn.; Ryan Whittier, a computing security graduate student from Rochester, N.Y.; Michael Cosmadelis, a third-year computing security student from Southold, N.Y.; Duc Phan, a second-year computing security student from Vietnam; and Franklin Nunez, a first-year computing security student from Westbury, N.Y. The winner of the regional competition gets an automatic berth in the 2018 national competition April 13–15 in Orlando. University at Buffalo will represent the Northeast and compete against other regional winners. Nine more regional winners will be determined before the National Collegiate Cyber Defense Competition.